The Here Shop and Gallery specialises in graphic art books, comics, zines, periodicals, and prints. It’s practically the last shop at the top of the arty-bohemian Stokes Croft in central Bristol. I drop in every so often on the way home, mostly just to see what quirky stuff is in at the moment. One afternoon in November 2018 I was excited to find a copy of Phillipe Druillet’s The 6 Voyages of Lone Sloane , tucked away on Here’s corner shelf reserved for album editions of classic comics. I know of Druillet in a somewhat roundabout way — I’m not really sure where I first heard his name — and I’d only seen enough sample panels to recognise his signature style. This was the first time I’d looked at a whole work, so I was very curious to see how a full story played out. Skimming through The 6 Voyages , my immediate reaction was disappointment. I confess I have a particular taste in drawing (bordering on snobbery), so the ostensibly crude figurework struck me as a bit amateur rather than auter. I put it back, wondering what the fuss was about. In fact, the influence of French SF-horror comics of the early 70s would bear some study. 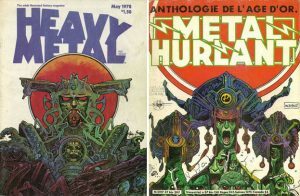 Druillet was one of the founders of French language anthology Métal Hurlant , a magazine influential enough that it was promptly republished in the US — and distributed in the UK — as Heavy Metal . Unlike domestic US and UK comics, Métal Hurlant was unreservedly for adults. Under it’s Heavy Metal brand, it was a magazine us early-teens could only skim furtively through on a newsagents’ shelf. I’m not even sure I made much sense of it, really. So it took on something of a legendary status for me and my nerd friends. We had settle for the somewhat tamer, although gently subversive, 2000AD . Métal Hurlant is credited with being an influence on the SF film aesthetic of the later 70s and early 80s. We can see this working it’s way through Jodorowsky’s practically legendary, failed attempt to make a film of Frank Herbert’s Dune (Druillet was not impressed by Jodorowsky’s eccentricities, and declined to be involved), on into Ridley Scott’s Alien and eventually Blade Runner. Although Jean Giraud (better known under the pen name Moebius) was made better known by this cross-polination, I’m likely to pick up work by artists prominent in this period out of curiosity. The 6 Voyage is a slim, hardback edition (published by Titan Comics, 2015), the cover collaged with selected elements from the grotesquely semi-architectural structures featured in the story. It’s a beautiful edition in full colour, and rich in Druillet’s omniously intense, sculptural black ink. There are six short stories of eight pages each, appearing feverishly drawn, at first sight over-fluid and careless about proportion, making monolithic narrative leaps between panels. So, having come to a perfunctory judgement, I put the book back and left the shop. But it had enough of an impact that I flipped through it on several more visits to Here before I finally felt I’d got what Druillet was about, and bought a copy. Drulliet’s style reminds me of Jack Kirby, one of the first artists of any sort to make an impression on me. It’s particluarly the way Kirby hyper-intensfies narrative drama in somewhat distorted figurework, and in facial expression specifically. But where Kirby would maintain a good semblance of proportion and anatomy when drawing say, Galacatus in comparison to the Fantastic Four (or the planet Earth, for that matter), Druillet may waive this in a way that can be disconcerting. And to be fair, that’s probably the point! The best example is the opening spread of story six, “Torquedara Varenkor”. Drulliet wants us to apprehend the absurd scale of this impossible bridge between the stars. Its piers use whole planets as staging points, and each is supported by a tormented collosus, many times the size of the planet its feet trample. Druillet represents the type of turrets, windows, arches, and stairways, best associated with a fairytale castle, albeit in Escher-like conjunctions. Paradoxically we see architectural features suitable for humanoid denizens, but in god-like proportions — each block of stone would be the size of a continent. Being forced to see things in two scales at once helps build the nightmarishness of Drulliet’s universe. We are actively going beyond the willing suspension of disbelief necessary for practically all SF, making its impossibility an absurdity a feature of the story. 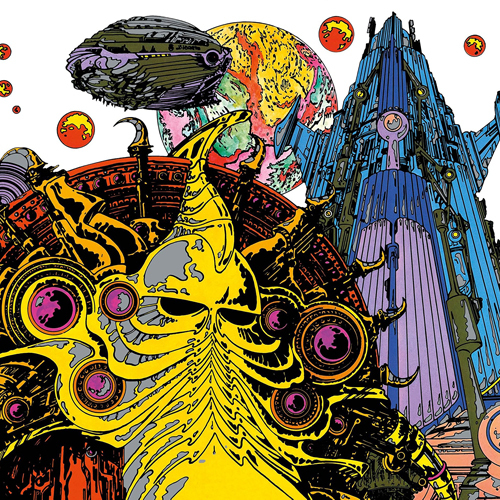 Druillet is very obviously influenced by HP Lovecraft, but with an added psychedelic twist. This is manifest in the ancient monstrousness of the beings inhabiting the two creators’ respective universes. Many of their antagonists are driven insane by their own collosal power, which is still trivial against the backdrop of the scale of the universe and of eternity. How much more trivial are the concerns and cares of ordinary mortals? Druillet takes Lovecraft’s theme of insanity one step further and adds the extra dimension of psycho-active hallucination. There are features of pseudo-Hindu art in conjunction with Baroque excess and Art Nouveau flourish, to the extent that even page structure frequently either disgreagrding panel bounds, or making panel structure an overt, geometric part of the storytelling. 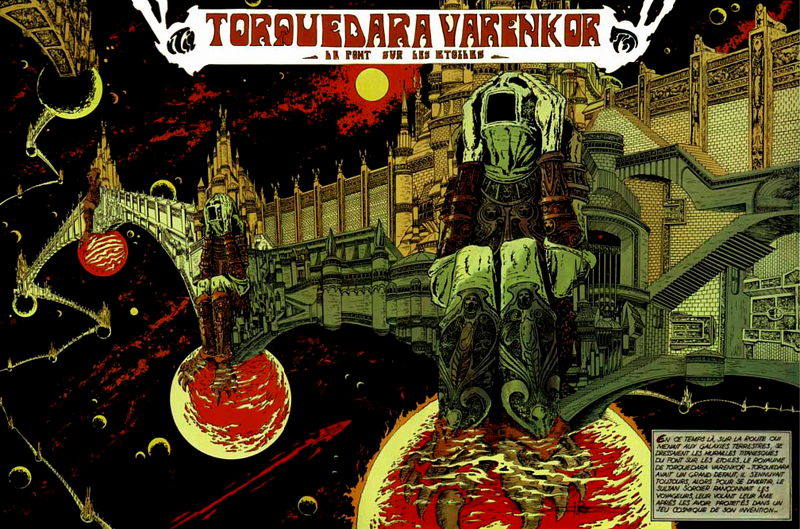 It’s here we probably feel that the Art Nouveau compositional stealings — check out the lettering and framing of the title block of Torquedara Varenkor story — are nowadays cliché, but at the time of publication would have nodded fashionably at psychedelic rock posters. Some of the lettering, particularly that representing onomatopeic background sound, is similarly heading towards being a structural part of the whole page. At it’s best, unlike Jack Kirby’s strict reliance on rigid panel progression to tell the story, Druillet’s pages and spreads are often a part of the narrative, because they are themsleves emphasising the grotesquery and scale of the universe and how it reaches around the merely human perspective. Druillets’ work has tonal parallels in Marvel comic books of what would have been the previous decade. If we consider and compare some of the Doctor Strange books by Stan Lee and Steve Ditko, or Fantastic Four by Stan Lee and Jack Kirby, we can see a similar sense of cosmic scale and briskly dramatic storytelling. The difference, composition aside, is the ressauring nature of Lee’s superheroes: they make dark forces of the universe appear containable, if not tamable. Human qualities ultimately prevail. Druillet, however, offers only the certainty of either destruction or insanity. This website was built with WordPress. SatDar is an original Theme based on the Foundation front-end framework. 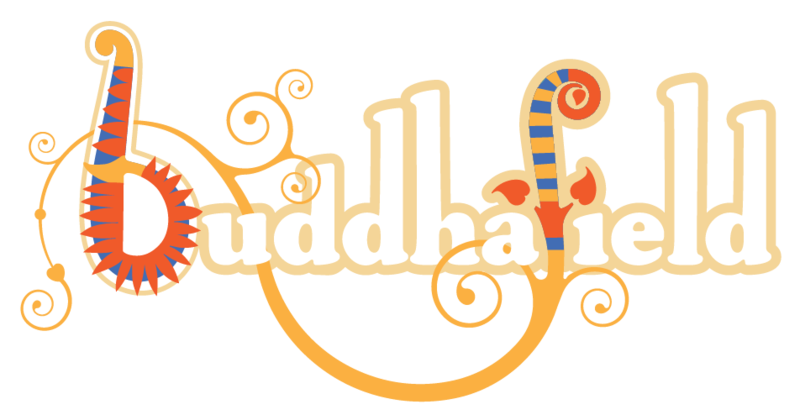 Designed & programmed by Satyadarshin.